Click the "Notes" tab on the main window. Click the "Notes" command in the Go menu.. The Note List displays a list of notes that are pinned to dates within a specified range. Notes that are not pinned to dates will also be listed. The Note List also shows search results. To open a note in the Note Editor, double-click its row. Today - The list will only show notes pinned to today's date. Tomorrow - The list will only show notes that are pinned to tomorrow's date. The next 7 days - The list will show notes pinned to dates within the next 7 days of the current date. The next 14 days - The list will show notes pinned to dates within the next 14 days of the current date. The next 31 days - The list will show notes pinned to dates within the next 31 days of the current date. The next 90 days - The list will show notes pinned to dates within the next 90 days of the current date. The next 180 days - The list will show notes pinned to dates within the next 180 days of the current date. The next 365 days - The list will show notes pinned to dates within the next 365 days of the current date. This calendar month - The list will show notes pinned to dates within the current month. This calendar year - The list will show notes pinned to dates within the current year. 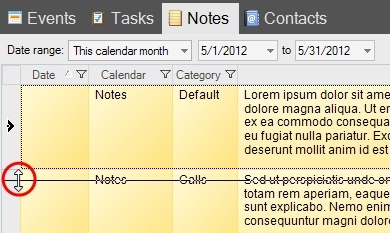 A range of dates - The list will show notes pinned to dates within a specified date range. The selected dates - The list will show notes pinned to the days selected in the Calendar View or Navigation Pane. All dates - All notes will be listed, regardless of their pinned date. Row heights can be adjusted to allow more of the note text to be visible. All rows will have the same height. To adjust the row height, click the row border on the left side and drag up or down. After releasing the mouse, all rows will be sized to the new height. Date - The date (if any) to which the note is pinned. This will be blank for notes that aren't pinned to dates. Calendar - This column contains the calendar names to which notes belong. Category - This column contains the category associated with a note. Multiple categories will be separated with semicolons. Note - This column contains the note text. Any additional formatting or non-text content will not be shown here. Text will wrap depending on the row height. 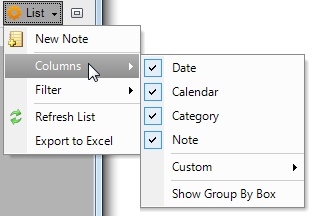 You can adjust the column order by clicking a column header and dragging that header to a different location. An arrow will display indicating where the column will be positioned. The column order is saved whenever it is changed, so the next time VueMinder starts, the column order will match what was most recently defined. To search for notes within the currently selected date range, type the desired search term in the Search box and press the Enter key. Previous search terms can also be selected from a drop-down list in the Search box. After commanding the search, a tab will be added at the bottom of the list, and the list will update to show only the notes (if any) that were found containing the search words. You can command multiple searches, and each search will be added as a separate tab. The searched date range can also be adjusted via the date range controls, and the search will be automatically refreshed to show notes within the new date range. To remove a search tab, click the tab's X button to close it. If all search tabs are closed, the full note list will be displayed. You can also click the red X in the search box to instantly clear all previous search results and return to the full list. 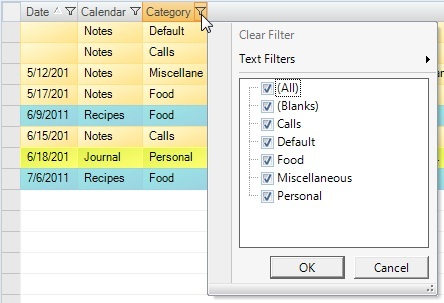 Note, this filtering is independent of any filtering performed in the Calendar Items area. Those filters take priority over the filtering in the Note List. Advanced filters can be specified by expanding the Text Filters menu. Selecting any of these advanced filtering commands will result in a filtering dialog being displayed, where one or more custom filtering conditions can be specified. Use the Operator and Operand values to define the filter. Click the "Add Condition" button to make a compound filter. 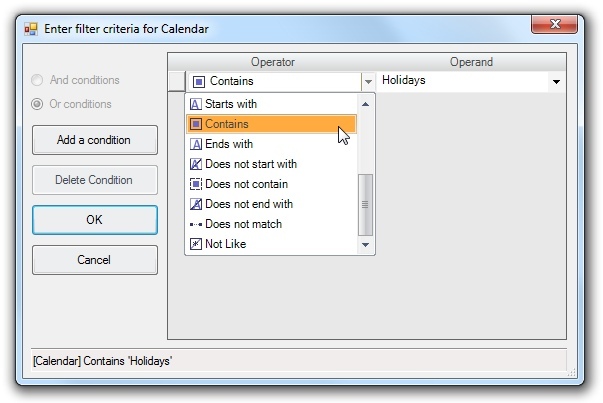 In the example below, the Category column is being filtered to only show rows with calendars containing the word "Holidays". After you're satisfied with the filtering condition(s), click the OK button to apply the filter. In most cases, the note list will automatically refresh. However, there may be some isolated cases where the list doesn't refresh. In those cases, you can force the list to refresh by clicking the List button and then clicking the "Refresh List" command in the drop-down menu. When a note row is right-clicked, a context menu will display. 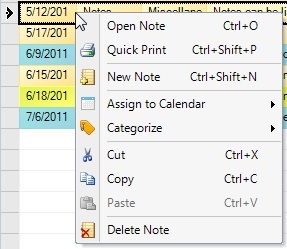 The available commands are the same as the commands accessible from the right-click context menu of the Calendar View, and are explained in more detail there. When clicking an empty row, the same menu that appears when the List button is clicked (in the upper-right corner of the Note List) will be shown. 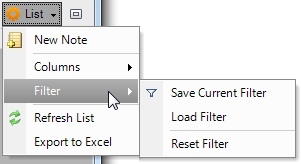 This menu enables filters to be saved/loaded or the list exported to Excel. These operations are described above.